The Apollo 11 crew kept an eye out for the bunny and Chang-O before they landed on the moon. The communication headquarters in Houston relayed the story of Chang-O to the astronauts. They told the astronauts that Chang-O resided with her bunny companion on the moon. Astronaut Collins said, “Okay, we’ll keep a close eye for the bunny girl.” The astronauts looked for both the man in the moon and the girl with the faithful bunny. Chang-O and her rabbit are an old legend with as much force today as during the Warring States period in China. 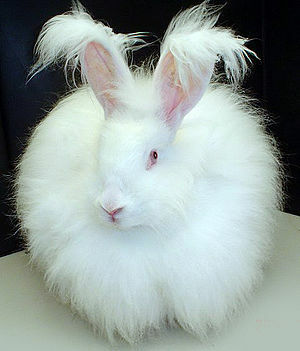 Bunnies are remarkable creatures with deep cultural meaning in China, Japan and Korea. In the Fujimini Adventure Book series for children, a mystical Asian island named Fujimini is home to many animals groups. Follow the characters, stories and games they play! ONCEKids website for books, games and stuff for your parents and teachers. On Fujimini Island bunnies hop in the grassy fields, and are friends with all the other animals. Bunnies are wonderful creatures. They are cute, soft and love having friends. In Chinese culture, the bunny is important to the Moon Festival. The bunny is a companion of Chang-e or Chang-o – the moon goddess. According to legend, the bunny is industrious and constantly pounds the elixir of life or, in Japanese and Korean versions, is pounding the ingredients for rice cakes. It seems wonderful and poetic that a bunny should be a companion to the woman in the moon. In Chinese culture the bunny is called the Jade Rabbit or, sometimes, the gold rabbit. On Fujimini Island pandas eat many kinds of food but in the wild pandas live on a steady diet of bamboo stems, bamboo leaves and bamboo shoots. Pandas eat almost 80 pounds of bamboo every day! A male panda is called a boar. 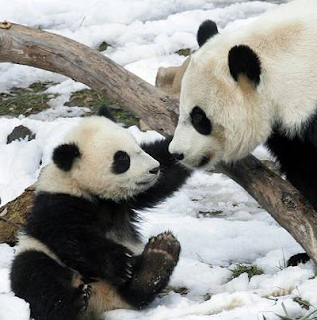 A female panda is called a she-bear and a baby panda is called a cub. She-bear pandas have one to five cubs or baby pandas at a time. 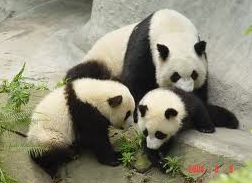 Did you know a group of pandas is called a sleuth? No, that doesn’t mean they wear trench coats, carry magnifying glasses and solve crimes. Pandas are great tree climbers, are most active during the day and don’t like hanging out with friends. They are mostly solitary creatures. It is probably difficult to be a pandas friend. Fujimini Island has Pandas - Do you know Pandas? On Fujimini Island Pandas climb the slopes. Pandas live in the bamboo forests of China. The Pandas have lived in these misty forests for many, many years. The Chinese honor the pandas and pandas are protected because they have become rare. Pandas are almost extinct. There are only about 1,000 living in the forests of China. The Chinese have known about the panda for a long time. But people in the West just discovered the panda when a German zoologist happened to see one at the beginning of the 20th century. A zoologist is a scientist who studies animals. There are actually two types of pandas: giant panda and red pandas. Giant pandas are as big as American grizzly bears. They can stand up to six feet tall and weigh almost 300 pounds. Mooncakes are served during the Moon Festival. 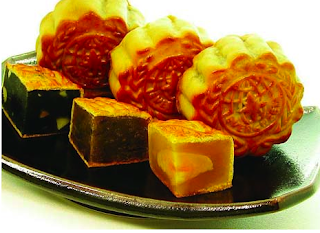 Mooncakes are dense, filled cakes with intricate designs or patterns on them. Many people also eat other round shaped foods such as pomeloes and eggs (sometimes tea stained). 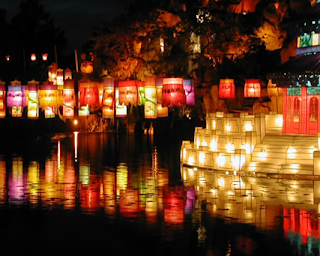 The Moon Festival is sometimes called the Lantern Festival. During the festival, lanterns are used as decorations and represent the glowing of the moon. Often, sky lanterns are used as decorations. Sky lanterns are suspended in the sky and look as if they are floating. During the Moon Festival many people celebrate by planting trees. Incense is also burned for Chang-O who floated up to the moon after taking her husband’s immortal pills. Chang-O’s companion is a rabbit, often depicted in jade. The Moon Festival is also called the Mid-Autumn Festival. This is a popular festival celebrated by the Chinese. The Vietnamese also celebrate the Moon Festival. The Moon Festival celebrates; you guessed it, the moon. Worshipping the moon dates back over 3,000 years ago. The Moon Festival is held on the 15th day of the 8th month in the lunar (another word for moon) calendar. The Moon Festival coincides with the autumnal equinox. This equinox is about the Earth’s position with the Sun. During the autumnal equinox the moon is at its roundest, which makes it particularly beautiful and inspires many people to have a festival in its honor. Step 4: Unfold and staple the edges together. Step 5: Cut a long, thin strip of paper for the handle. Staple it to the lantern. In Red Penguin and the Missing Sushi, the animals on Fujimini Island make paper lanterns. Paper lanterns come in many sizes and shapes. 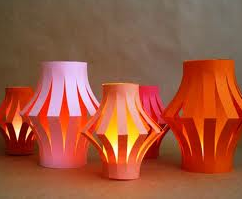 Paper lanterns are often associated with festivals and are common to the cultures of China and Japan. Paper lanterns are also used as a decoration. Stores in Japan often advertise specials on the paper lanterns. The animals of Fujimini Island love lanterns because they are pretty to look at and fun to make. 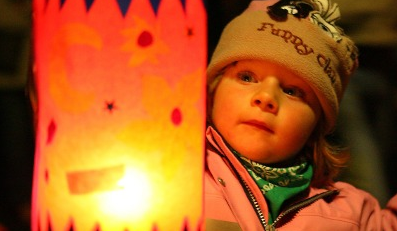 Come back soon and we will tell you how to make a paper lantern.